When a magnitude 6.8 earthquake hit his hometown, Gyumri, on December 7, 1988, 14-year-old Ara Tadevossian’s apartment building collapsed on top of him and his mother. He was trapped. But in a grim way, he was lucky: A chunk of concrete was pressing on his leg in just the right place – a serendipitous tourniquet that stopped him bleeding to death. As hours turned to days, the crying and screaming around him quieted. Tadevossian’s friends and neighbors were dying. On the 30th anniversary of the Spitak earthquake, survivors are marking not only an Armenian tragedy, but a pivotal event in Eurasian history. "The Armenian earthquake was the beginning of the collapse of the Soviet Union," said Tatul Sonentz-Papazian, who helped coordinate rescue efforts in 1988 for the Massachusetts-based Armenian Relief Society. The earthquake, he believes, forced the Soviets to accept that their system was broken – and that their isolation had to end. For the first time since World War II, the Soviet Union allowed large shipments of foreign aid to cross the Iron Curtain. According to a 1988 article in Time, 67 countries sent relief, including almost 2,000 rescue workers and over 100 supply planes. In the era of perestroika, or restructuring, the world came together to help rebuild a Soviet nation. Tadevossian was calm discussing the terror 30 years ago. His voice faltered only when recalling a neighbor trapped with her son. The Tadevossians were among a handful of survivors from their apartment building. 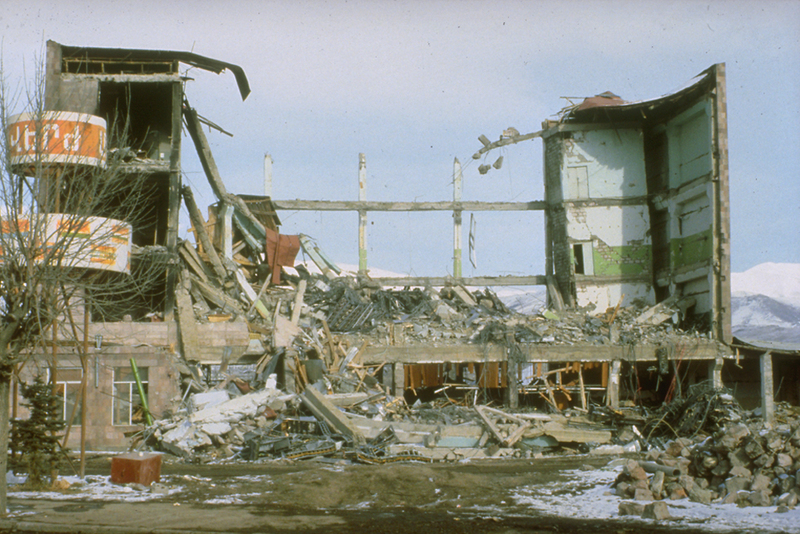 The devastation was widespread, in part due to the shoddy construction of Soviet buildings. One 1990 study noted that this was the first time in the 20th century that an earthquake of less than magnitude 7 had taken more than 10,000 lives. In all, at least 25,000 people died, 19,000 were injured, and 500,000 were left homeless at the start of winter. “These people were living in a system that encouraged deceit and corruption and the results were very badly built buildings,” said Sonentz-Papazian. A group of engineers and geologists from New Zealand reported that, for example, out of 78 nine-story precast frame apartments the Soviets had built in Leninakan, as Gyumri was then known, “only six survived the earthquake, but these, too, were damaged beyond repair.” For many months, there was only one toilet for every 100 people. Before the earthquake, Ara Tadevossian was an athlete, nationally competitive in judo. Once he was rescued, both his legs had to be amputated. Tadevossian is not sure that losing his legs was inevitable. He knows that the hospitals were overcrowded and that doctors had to make difficult choices. “They did not have enough time to perform surgery because if they performed surgery and saved your leg, three or four other people would have died in the hallway,” he explained. He feels no bitterness; he would not have wanted to trade his limbs for someone’s life. “I will never know, and to be frank with you, I don’t even want to know if my legs could have been saved,” he said. The amputation was only the first step in a journey that would scatter the Tadevossian family across the globe. His mother went to St. Petersburg for medical care; his brother, also an athlete, went to Kazakhstan to continue training; and Ara Tadevossian, with the help of a U.S.-based philanthropy called Project Hope, got on a plane to Syracuse, in upstate New York. He didn’t speak a word of English. He had never left the Soviet Union. One aunt accompanied him, but she could not stay long. A kind nurse who was also Armenian, Arsho Vartanian, helped him and became his legal guardian. Her family and friends became his support network, his family in America. He learned English and learned how to walk again. Tadevossian healed, returned to Armenia and reunited with his family. But his homeland had changed radically. The collapse of the Soviet Union and the subsequent war with Azerbaijan over the Nagorno-Karabakh region did not help the recovery effort. 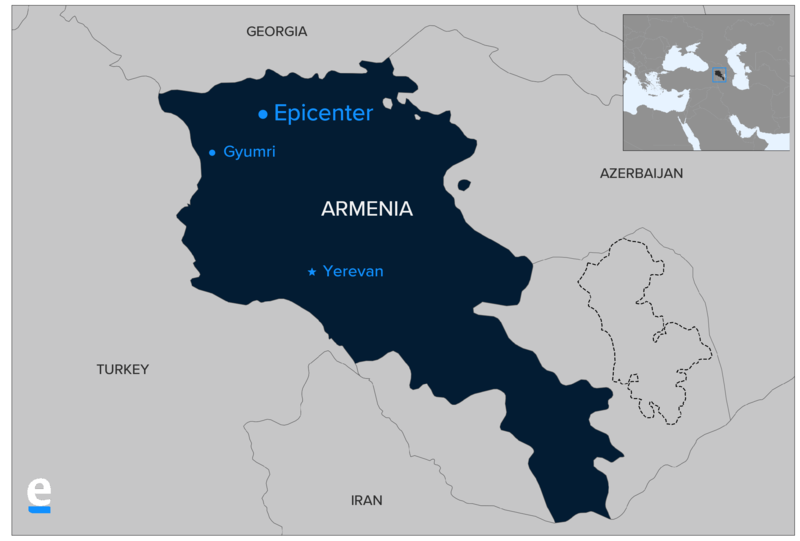 Armenia’s population has fallen 16 percent since the earthquake, mostly due to emigration, according to World Bank figures; the government says the population of Gyumri – Armenia’s second city – has halved. Across the country, unemployment remains high. The aftershock of losing 25,000 lives lingers in ways that economic statistics cannot capture. Still, Tadevossian believes that the trauma did have meaning. When he was 18, Tadevossian returned to the U.S. for more reconstructive surgery and then enrolled in college. He has stayed ever since. He and his American wife have an 11-year-old son. He got an MBA and now works as a project manager for a utility company. One of the projects he’s most proud of involves making gas pipes more resilient in case of natural disaster. And he is still close to Vartanian, the nurse who became his legal guardian in America, who is now in her 80’s. They talk every day. Sharon Lurye is a Brooklyn-based journalist and a graduate of the Columbia University School of Journalism.